The DS has kind of been a magnet for those old "point and click" games that is probably a result of its innovative technology and more specifically the touch screen. With this in mind, Last King of Africa is another one of those titles, however it also adds the use of the microphone into the gameplay as you attempt to solve this sometimes "slow" adventure game with puzzles and quests. The story of Last King of Africa takes you deep into Africa as gamers play the role of Ann Smith, the daughter of the last king of Maurania. It begins with Ann travelling to her dying her father and as fate would have it, things start to go awry in the worst of times. To compound the situation, a rebel faction has taken over the north of the country where her plane crashes and when Ann awakes, she has no memory of where or whom she is and this my good friends is where the adventure begins. 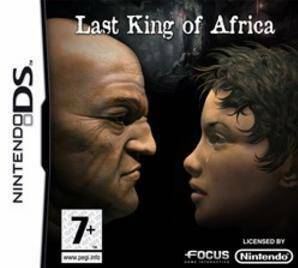 In its essence as mention, Last King of Africa is a point and click game that has the gamer interacting with the environment and various characters through the use the DS touch screen. In actual fact, the stylus replaces the good old fashioned mouse and these games were once a staple diet of PC gamers. 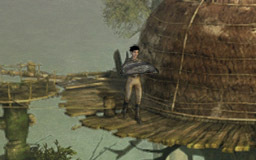 Although the genre has pretty much dried up on the PC, this genre has made an interesting comeback onto the DS, although we have our good, medium and bad titles to match. Thankfully, Last King of Africa falls between "good" to "medium" and although may not be the most original gameplay to land on the console, it's quite sturdy and we could comfortably say that this title would be good game for female gamers. The control system of Last King of Africa works quite well as you use the stylus to do just about everything, whether that's moving Ann Smith within the gaming environment by "tapping" on the screen or by tapping on objects, you can add them to your inventory in order to hopefully assist you with some puzzles later down the track. Needless to say there is quite a lot of "clicking" in the game and compared to the action games of title, the game is rather laid back and is quite a slow and surreal experience. The unfortunate aspect of the Last King of Africa is the predetermined story which means once you have completed this title, there is little replay value as you have solved all the puzzles. 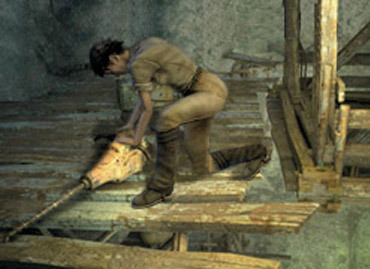 The puzzles and quests in the game are at an easy to moderate level of difficulty which ensures that younger gamers can enjoy the title without it becoming too frustrating. Older gamers may find the title a little lackluster as this genre has kind of been stuck in a time warp. Thankfully the story of Last King of Africa is rather engaging as you attempt to piece your life together piece by piece. 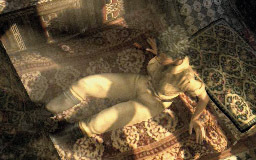 The first quest is trying to escape from the Prince's palace and unfortunately for Ann, she has been put into his harem. Without spoiling the game too much, some of the quests are imaginative and not your traditional point and click quests as before you engage in the main crux of the game, you need to escape from the palace. This is done by collecting a variety of items from the palace such as a "costume" to escape and you also need to create some "perfume" to assist in your disguise. If you do become stuck in the game and cannot find the right path or object, there is "hint system" that highlights certain parts of the gaming environment to assist you with your quest. The unfortunate aspect of just about all adventure games is that sometimes the clues are a little confusing, although I'm sure it made sense to the developers. Graphically, the title is quite impressive on the DS and is one of those well thought out and colourful games that has not been just slapped together. The star of the game are definitely the rich and diverse backgrounds and of course the well drawn characters which interact well with the gaming environment and don't look superimposed. Match that with a nice ambient soundtrack and of the odd sound effects here and there and Last King of Africa is a rather nice looking and decent sounding game. In conclusion, Last King of Africa contains an interesting storyline that will hopefully draw in those female gamers, although male games may find it a little too repetitive. At the end of the day, this will definitely keep the female crowd entertained as they attempt to complete the title and as you progress, you are awarded with new vastly different areas and the mystery of this adventure game becomes even clearer.